It’s been quite a while since I’ve gone off-road on a 4×4 adventure drive. Thus, when Nissan Philippines, Inc. (NPI) invited yours truly for a “Go Anywhere” drive around Bicol with the new Nissan Terra sport utility vehicle (SUV), it was hard to say no. More so when I learned that NPI President Ramesh Narasimhan will be joining us on the whole trip. So, on a cool early February morning, I found myself waiting for 7:30AM Cebu Pacific flight to Legaspi, Albay, which of course, left Terminal 3 of the Ninoy Aquino International Airport two hours late. However, like most of my media colleagues, I ignored the inconveniences caused by the airport delay and looked forward to two days of rollicking adventure with the Nissan Terra. The minute we got off the plane and out of the Legaspi airport, we were greeted by the team of George Ramirez and company. “Hmm… this is going to be fun!” I thought to myself. I looked for our assigned Lunar Metallic Gray Nissan Terra (#3) and found myself teamed with Jong Arcano of the Philippine Daily Inquirer and Tet Andolong of the Business Mirror. As soon as we got settled in our vehicles, we rolled off from the airport and drove out towards Naga City. NO BOUNDARIES. There’s practically no limit to where the Terra can go. A Fiery Red Special Edition Terra (below) settles snugly backdropped by the majestic Mayon Volcano. During our drive to Naga and back to Legaspi, Jong, Tet and I took turns in driving the Terra. We observed how lithe it is to drive, compared to the cumbersome feel of other SUVs, and how comfortable the ride was on paved roads despite the suspension’s robust design. We were so comfortably cocooned inside the Terra while we were travelling on the highway that we didn’t notice the time and the traffic on the roads between Legaspi, Polangui, and Naga City. After a sumptuous lunch at Casa Soriano, we drove back to Legaspi through the scenic Coastal Highway, experiencing the mighty 450 Newton-meters of torque from the Terra’s 2.5-liter YD25 DDTi turbo diesel engine and the adaptability of the seven-speed automatic transmission on the mountain roads overlooking the Pacific Ocean. If only the view was the same in Metro Manila, I wouldn’t mind getting stuck in traffic inside the cool, comfortable confines of the Terra. Dusk fell as we were nearing Legaspi City and we hurriedly drove up a viewpoint overlooking the Mayon Volcano to catch the last few minutes of sunlight. NPI arranged a camp-like setting complete with a bonfire, sumptuous dinner and live entertainment for the media participants. A pleasant surprise was the introduction of a special edition Fiery Red Nissan Terra with a special interior package. Only a hundred units will be sold throughout NPI’s nationwide dealership network. 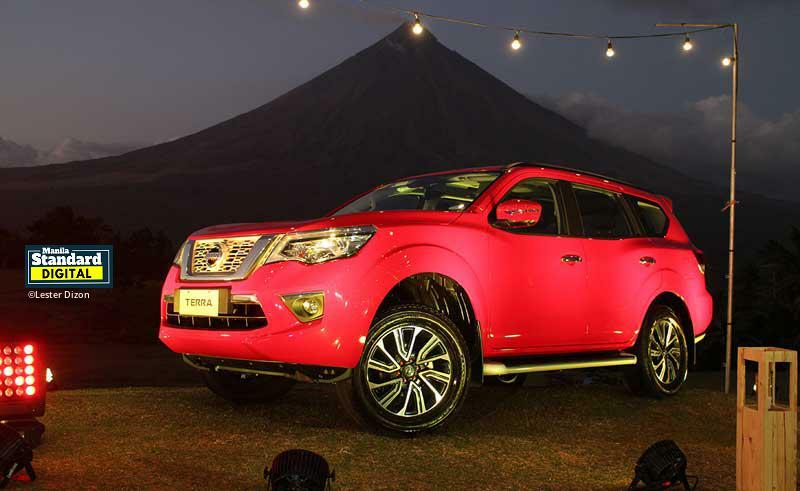 My mind was racing – after a few hundred kilometers on the highways around Bicol, I’m beginning to want a Fiery Red Special Edition Nissan Terra! If only I have the cash right now. We didn’t stay late at the camp because we felt so tired after waking up early to catch the much delayed flight and driving the whole day around the Bicol region. So, we were driven to our residence for the next two nights, the Oriental Hotel, and I promptly tucked in for the night. The next morning, we were up early to drive to the Black Lava Base Camp at the foot of Mayon Volcano. 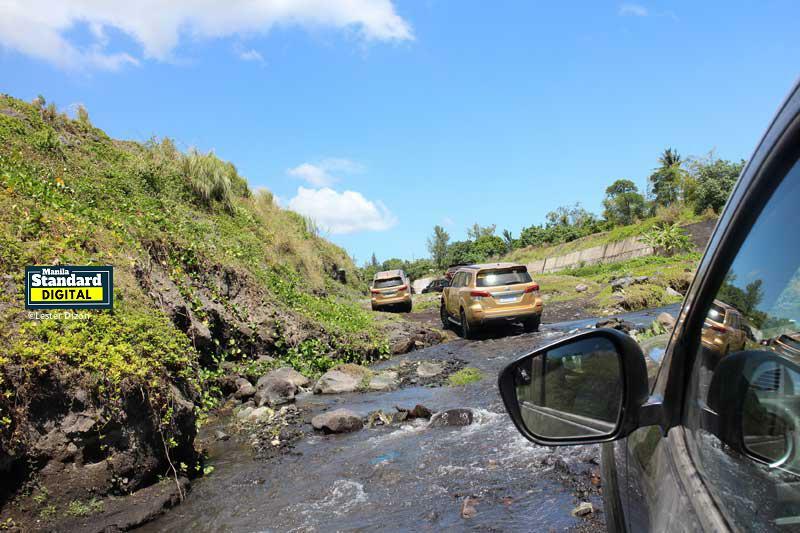 NPI arranged a day of driving adventure around the slopes of the majestic volcano using the Nissan Terra 4×4 and some all-terrain vehicles (ATVs). To kick off our adventure, we climbed up a thick tall wall made by black lava deposits to find a helipad (ha-ha) on top and a fantastic view of Mayon. The climb was not too difficult but the view was worth the effort. Of course, everybody wanted to get a selfie photo with the volcano, which, as legend tells it, hides behind a veil of clouds when persons with impure hearts try to view it. My initial photos with Mayon were partially obscured by clouds. Does that mean I have a “partially” impure heart? Or do I have a partially pure heart? It must be one of those “the glass is either half-empty or half-full” kinds of moments. I must have a pure heart – my view of Mayon, after a few tries. I followed the lead of Raymond Tribdino, the Motoring Editor of Malaya, and took the zip line down and back to our convoy, as did Ramesh, the adventurous NPI president. He would later jokingly ask the videographer to review the footage of his zip line ride to find out who “pushed” him down the line. Once back at the base camp, we were briefed on our batches and vehicle assignments. Raymond became our assigned 4×4 off-road driver in our Terra since Jong and Tet were trying to beat their deadlines while working on their phones, while I found myself simply too lazy to drive. Besides, how can I take scenic photographs of the volcanic landscape if I was driving? While resting to admire the scenery, I was contemplating on the difference between roughing it out on an ATV and roughing it out with the Nissan Terra 4×4. If you’re a young gung-ho thrill seeker, you will undoubtedly say that the ATV is the way to go. But if you’re a middle-aged adventurer like me, the comfort and assurance of a Nissan Terra 4×4 will be your primary choice. While it is true that an ATV can stir the soul while you’re testing the limits of your endurance, the Nissan Terra 4×4 is a willing partner to really go anywhere.